Jorge Herrera's exceptional artwork can be seen throughout the United States due to his reputation for innovative artistry and attention to detail. Decorative paint finishes that replicate the appearance of materials such as marble, wood or stone. Any piece of artwork painted or applied directly on a wall, ceiling or other large permanent surface. Art technique that uses realistic imagery to create the optical illusion that the depicted objects exist in three dimensions. Graining is the practice of imitating wood grain on a non-wood surface in order to increase that surface's aesthetic appeal. Frequently used in demanding applications such as factory floors, garage floors, and restaurants, and water-based versions are often used to seal concrete countertops. 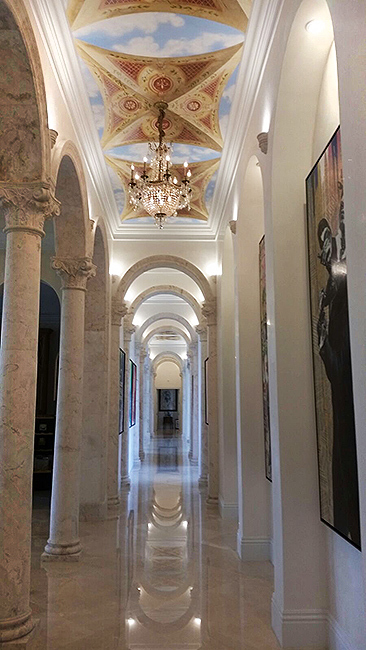 The preparation and finishing of a surface to imitate the appearance of polished marble. Jorge has extensive experience in ceiling work. Take a look at the portfolio page for images of recent projects. Calima offers a wide range of special restoration skills and experience. Calima Decor is located in Palm Beach Florida. If you need services outside of the U.S., please contact Jorge to discuss travel arrangements. “His work is amazing” says Mrs. Bansal. "Thrilled with the work Jorge has done, the Bansals already have more projects lined up for him." Jorge hopes to work with a New York gallery and continue his work in faux finishing. He has plans to open another studio in the near future.